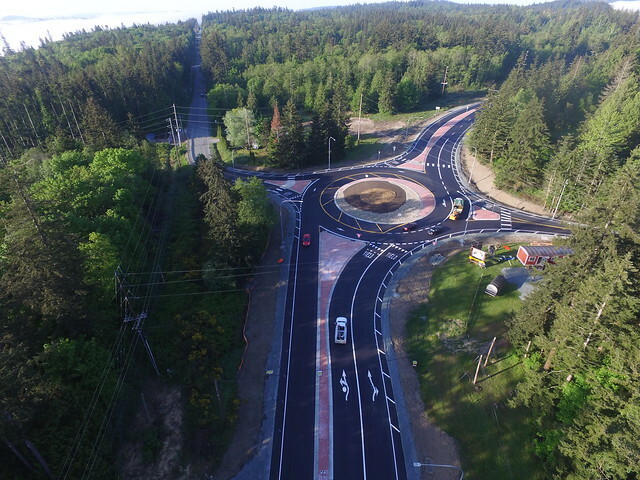 2014 Ministry of Transportation and Infrastructure’s Deputy Minister’s Consulting Engineers Awards, originally uploaded by TranBC. I found this image on the Ministry’s flickr account. This won an award – not for the design (though it should) but for Construction Management and Supervision Services. 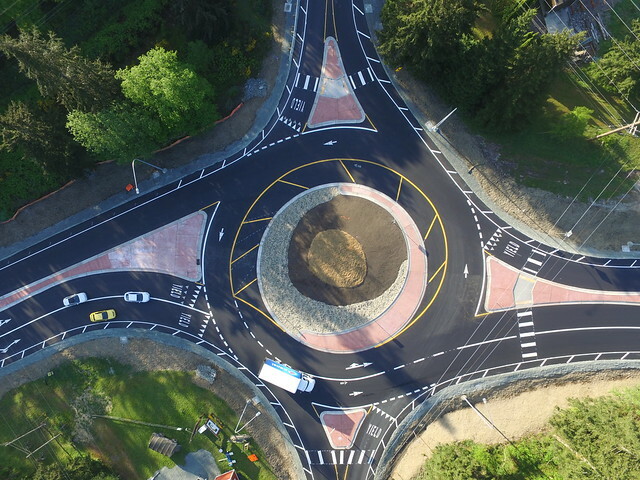 I have often written on this blog about roundabouts – and why they must never be confused with traffic circles. 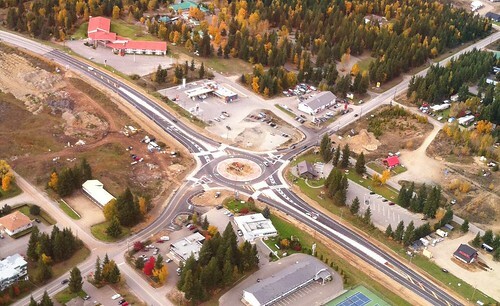 This is Highway 5 and Clearwater Valley Road. I will need to go find out on Google exactly where that is as the MoTI have not provided a map reference. This study examined the impact of transportation infrastructure at intersection and non-intersection locations on bicycling injury risk. In Vancouver and Toronto, we studied adult cyclists who were injured and treated at a hospital emergency department. A case–crossover design compared the infrastructure of injury and control sites within each injured bicyclist’s route. Intersection injury sites (N=210) were compared to randomly selected intersection control sites (N=272). Non-intersection injury sites (N=478) were compared to randomly selected non-intersection control sites (N=801). At intersections, the types of routes meeting and the intersection design influenced safety. Intersections of two local streets (no demarcated traffic lanes) had approximately one-fifth the risk (adjusted OR 0.19, 95% CI 0.05 to 0.66) of intersections of two major streets (more than two traffic lanes). Motor vehicle speeds less than 30 km/h also reduced risk (adjusted OR 0.52, 95% CI 0.29 to 0.92). 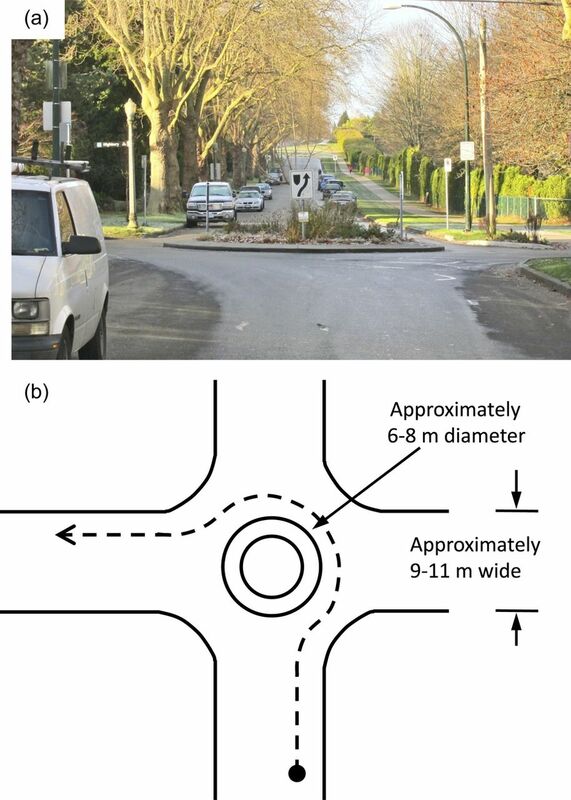 Traffic circles (small roundabouts) on local streets increased the risk of these otherwise safe intersections (adjusted OR 7.98, 95% CI 1.79 to 35.6). At non-intersection locations, very low risks were found for cycle tracks (bike lanes physically separated from motor vehicle traffic; adjusted OR 0.05, 95% CI 0.01 to 0.59) and local streets with diverters that reduce motor vehicle traffic (adjusted OR 0.04, 95% CI 0.003 to 0.60). Downhill grades increased risks at both intersections and non-intersections. These results provide guidance for transportation planners and engineers: at local street intersections, traditional stops are safer than traffic circles, and at non-intersections, cycle tracks alongside major streets and traffic diversion from local streets are safer than no bicycle infrastructure. This confirms what I have been saying on this blog for a long time. The type of traffic circle that is so extensively used in Vancouver (and that is where this research was done) is not an improvement. The evidence shows that they actually increase risk. Casual observation will quickly confirm that while some drivers slow down, many regard them as a challenge. I have also seen drivers make left turns simply by going round the circle the wrong way. In a number of locations (such 29th Avenue at Blenheim) the City has added signs saying “Yield to traffic in circle” which has absolutely no discernible effect on drivers on Blenheim – which they regard as the arterial – to the peril of any road user on 29th which also happens to be a bike route. Time for the City to revise its approach, and if there is no room for a correctly designed roundabout, revert to the four way stop – which at least the locals seem to both understand and usually comply. The other one is that separated bike lanes reduce collisions for cyclists – no surprise there. Not politics, but traffic regulation. And one of my hoby horses. A letter appears in the ITE Journal this month that is worth repeating here as it introduces information that I was not previously aware of. The author is Kenneth Todd, and while I do not have his permission to reproduce it I think he will be pleased that this idea is promulgated. The yield to the right concept originated in France. Charles-Marie Gariel, a professor of physics at the School of Highways and Bridges, proposed it in 1896 as a rule when two cyclcists arrived at an intersection at the same time (source: Gariel, Charles Marie. “De la Règle à adopter en cas de Rencentre sur deux Routes qui se croisent” Revue Mensuelle du Touring-club de France July 1896 pp. 246-247) The rationale was that the cyclist on the left had no need to stop or slow down too much when yielding to the one on the right. Gariel only considered the conflict between two cyclists, not three or four. Paris, France adopted the rule in 1910 for intersections where two roads of equal width met, and another rule gave drivers on wide roads priority over those on narrower ones. The League of Nation’s International Convention relative to Motor Traffic adopted the rule in 1926, as did the US Uniform Vehicle Code. It remains valid in all US states and by international convention in all countries where traffic drives on the right side of the road. As William Phelps Eno, the American “father of traffic control,” and others pointed out in the 1920’s, the rule paralyzed traffic when drivers entered an intersection from all directions and obstructed others from leaving. (sources: Eno, William Phelps Simplification of Highway Traffic Saugatuck CT USA Eno Foundation 1929 p.15 McClintock, Miller Street Traffic Control New York NY USA: McGraw Hill 1925 pp 126-127 Lefferts, E B “Giving Man on Left Right of Way” National Safety News December 1922 p40) The rule is rarely in force today, but it shows that early law-makers lacked the most elementary understanding of the intersection problem. Reversing the rule so that the driver on the right gives way to the one on the left would make an intersection function like a mini-roundabout and avoid the installation of countless traffic signals. The problem is that the ITE Journal is not read outside of the profession – you have to be a Member to get hold of it. I doubt that it is in many public libraries. So I am taking this bold step of doing more than a brief quotation in the hopes that this idea will spread.